Callie is a Speech-Language Pathologist Clinical Fellow at Building BLOCS who provides speech therapy services for individual clients. 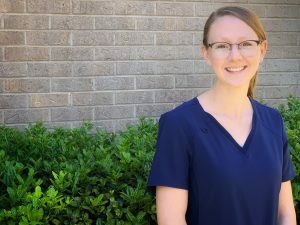 Callie received her Bachelor’s degree from the University of Arkansas in 2015 and her Master’s degree in Speech-Language Pathology from Texas State University in 2018. She is currently working towards obtaining her Certificate of Clinical Competence (CCC-SLP) from the American Speech Language and Hearing Association (ASHA). She has had clinical experience treating and assessing a variety of language, articulation, fluency and voice disorders with clients ranging from young children to adults. Additionally, she has experience working as an ABA therapist and applying verbal behavior techniques and social skills training with children with autism ages 2-8. Callie’s areas of interest include autism-spectrum disorders, language delays and disorders, speech sound disorders and social skills and pragmatic disorders. In her free time, Callie enjoys running, painting, playing the violin, and spending time with her husband, Andrew, and baby, Miles.